Has twice been recognized by UNESCO as a World Natural Heritage Area for its exceptional ascenic beuty and one of the world’s greatest natural wonders. And be listed among the 20 most beautiful UNESCO world heritage sites by famous travel website CNTraveler, Halong Bay (Vietnam) is one of the most magical planet’s special places that travellers don’t miss when comming to Northern of Vietnam. Paradise Cruises offer the finest way to explore the charming beauty of Halong Bay! The Paradise Cruises Experience is an immersion in culture, heritage and natural beauty of one of the most enchanting destinations in the world. Follow us on a journey rich in local color, luxurious surroundings, gracious services to explore the art of Paradise Cruises. Natural wonders and unique cultural experience lie every turn during this – your most memorable – Vietnam holiday package. More important point, Paradise Luxury cruise supply an enchanting sightseeing. Tourists start the voyage through passing the majestic splendid beauty of Sung Sot cave, then taking Kayak tour at Cua Van fishing village to witness life’s local life. Absolutely, you’ll never forget every awesome experience when chose beautiful paradise yacht. Dragon Legend Cruise is famous for its special itinerary and suitable for family with connecting cabins. 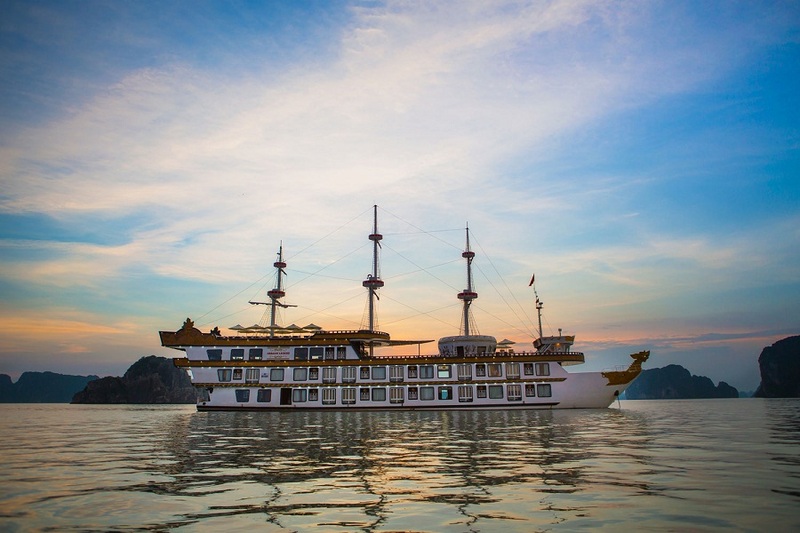 This cruise takes guests to Bai Tu Long Bay with an off the beaten track itinerary, far away from the crowds. Each of the 24 spacious, wood-paneled cabins has been luxuriously designed for the comfort and enjoyment of guests. The beautifully presented furnishings in each 26.5 sq.m cabin are influenced by traditional Vietnamese culture and comprise a collection of authentic, handmade art from different regions throughout Vietnam (Chu Dau ceramics, Red Zao brocade, wooden statues…) The well-appointed, 9 sq. m bathrooms include bathtubs for a soothing seawater or fresh water treatment where guests can relax and gaze out on the Bay from a large window. Two of the cabins have connecting rooms to accommodate families. 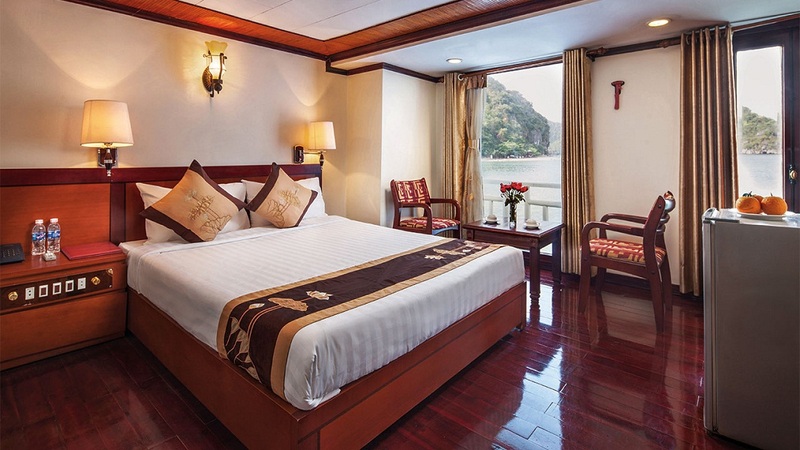 Jasmine Cruise is also one of the best 5 star cruises in Halong Bay. This Cruise launched in late 2007, the attention to detail and quality of design is apparent in every inch of this newly-built junk, artfully marrying space, rich 1930s Indochine-style wooden décor and exquisite ornamentation throughout its air-conditioned 24 bedrooms, restaurant, bars and communal spaces. Whether you want to throw a party on the terrace, enjoy an intimate candle-lit dinner in the Jasmine restaurant, or just relax and unwind in the Jasmine Spa, Halong Jasmine is the perfect way to enjoy the bay. The Au Co launched in Apr 2012 – The biggest cruise on the bay is a remarkable 55.29m in length and 10.43m in width. Each of our 32 spacious cabins has its own private balcony or terrace – allowing unparalleled private views of the surrounding seascape. 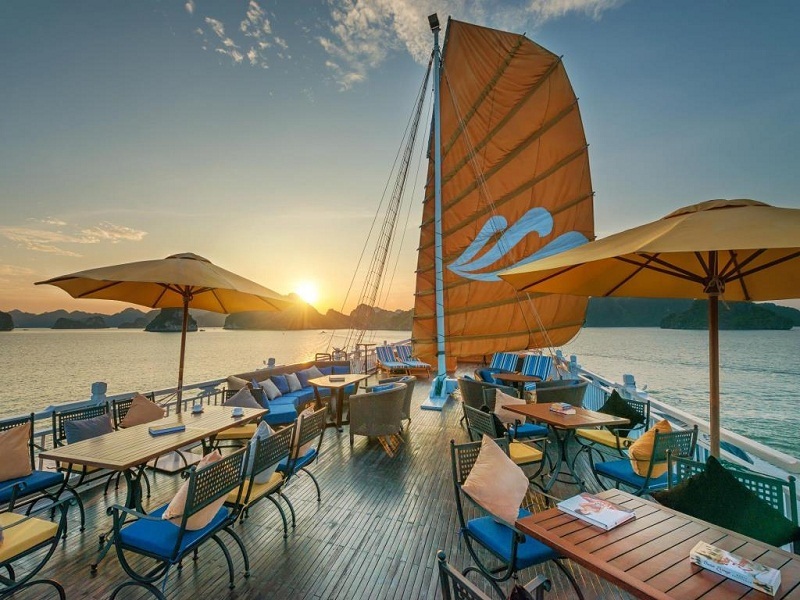 On the upper decks, our elegant restaurant and open-air bars are designed along principles of “Feng Shui” to heighten our passengers’ sense of connection with the wonderful environment of the surrounding Gulf of Tonkin, as well as giving them a taste of the Orient and Vietnamese culture. Through innovative use of space, design features, and luxurious attention to detail, Auco Cruise aim to give our passengers a truly unique cruise experience. 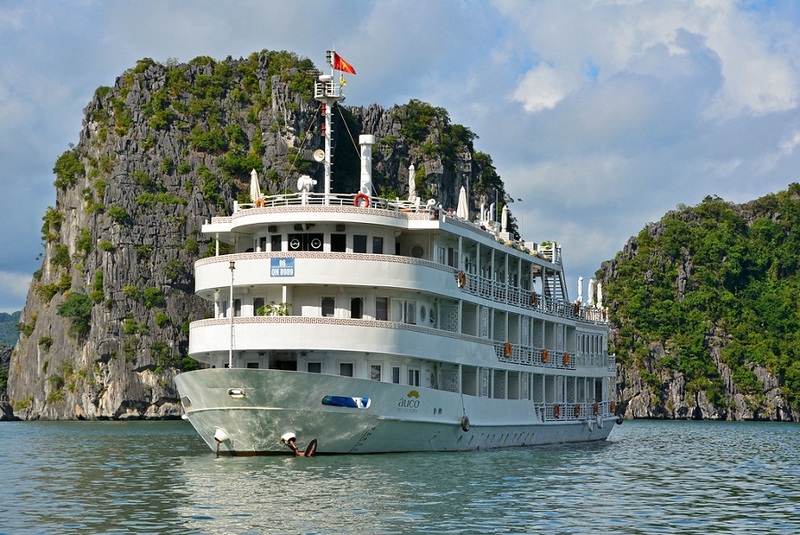 Halong Emotion is a Luxury Cruise in Halong bay, combines charm and great comfort to meet the growing demand of travellers looking for luxurious cruises in the bay. The first boat, launched in July 2008 , features 28 air conditioned cabins, with private bathrooms and facilities similar to a boutique style hotel. Besides, Vietnam Typical Tours offers many deluxe and budget cruises. 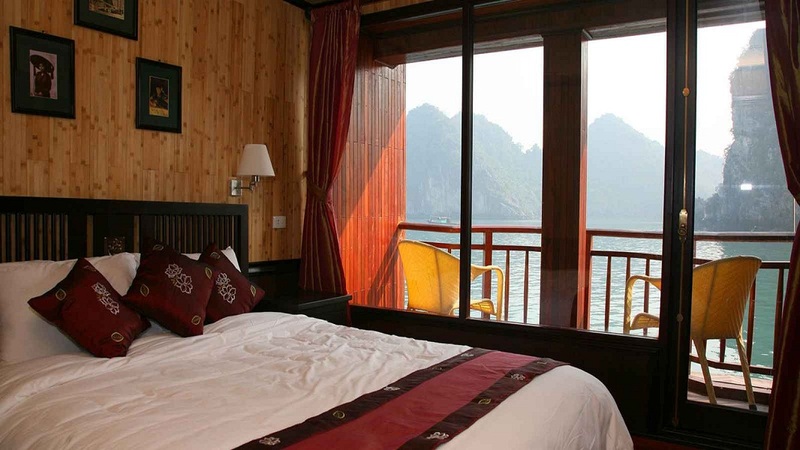 Let’s book Halong Bay cruises with us to get the best price.